Brick Town Talk: Streamline and Seam Lines - LEGO Town, Architecture, Building Tips, Inspiration Ideas, and more! Century Drive - (BTT) Not all Art Deco buildings are cut from the same cloth. 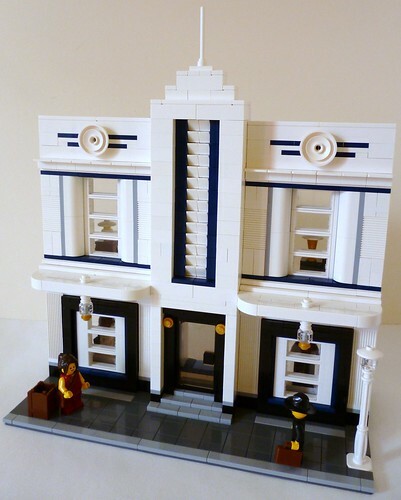 Trading decorative panels and sharp angles for smooth surfaces and elegant curves, this Streamline Moderne shop is the perfect showcase of the style. Speaking of style, those wanting to make a fashion statement are strongly encouraged to step inside and pick up one of their signature pieces - perhaps not cheap, but can you really put a price on looking so good?